CEGA has grown rapidly in recent years and today is one of the world’s leading providers of medical and security assistance, travel risk, health screening and claims management services. The 24-hours, 7-days a week nature of the company’s contact center meant that a new highly flexible and automated workforce management (WFM) was required to maintain high levels of customer service and staff engagement. 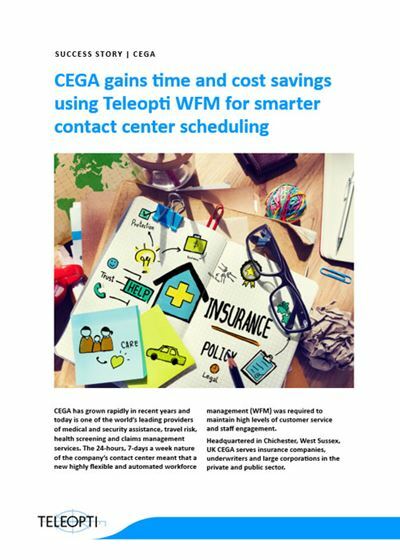 This success story looks at the complex situation and needs of CEGA's customer service, and the consequent results it reaped with Teleopti WFM - along with the engagement and RTA improvements.